Ten NBA games were played last night, 32 European players in action. 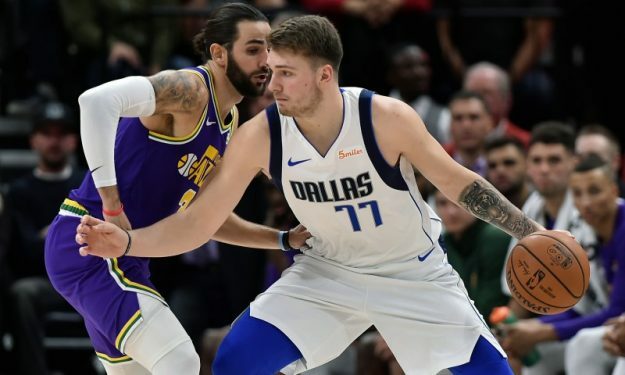 The Dallas Mavericks suffered a 117-102 loss from the Utah Jazz despite Luka Doncic 24 points. Rudy Gobert recorded his 10th double-double in 11 games with 17 points and 10 rebounds, he also blocked four shots. Ricky Rubio also scored a double-double with ten points and 12 assists. Dennis Schroder recorded a season high 28 points and led the Oklahoma City Thunder to their 6th straight victory. Despite Russell Westbrook absence, the Thunder got a 95-86 win over the Cleveland Cavaliers. Cedi Osman left the game with back spasms. Evan Fournier led the Orlando Magic with 27 points, but his team couldn’t hold on against the Detroit Pistons at the “Amway Center” and lost 103-96. The winners snapped a five-game losing streak. Bogdan Bogdanovic made his season debut, but the Sacramento Kings didn’t avoid a 114-105 home defeat by the Toronto Raptors. Red-hot Serge Ibaka (14 pts., 14 reb. ), Jonas Valanciunas (11 pts., 10 reb.) and OG Anunoby (11 pts., 7 pts.) were on hand for the winning team. Cleveland Cavaliers Oklahoma City Thunder 86-95 Ante Zizic 10 pts., 9 reb., Cedi Osman 0 pts., 1 reb. – Dennis Schroder 28 pts., 7 reb., 1 stl., 1 blk., Alex Abrines 9 pts., 1 stl. Orlando Magic Detroit Pistons 96-103 Evan Fournier 27 pts., 5 reb., 3 ast., 3 stl., 1 blk., Nikola Vucevic 14 pts., 9 reb., 4 ast., 1 blk. – Zaza Pachulia 2 pts., 5 reb., 1 stl., Jose Calderon 0 pts., 3 stl,, 2 reb., 1 ast. Atlanta Hawks New York Knicks 107-112 Alex Len 9 pts., 5 reb., 1 blk. – Enes Kanter 17 pts., 11 reb., 2 blk., Frank Ntilikina 14 pts., 3 reb., 3 ast., 1 stl., Mario Hezonja 1 pt., 2 reb. Miami Heat San Antonio Spurs 95-88 Davis Bertans 19 pts., 4 reb., 1 ast., 1 stl., 1 blk., Marco Belinelli 8 pts., 3 ast., 2 stl., Jakob Pottl, 3 pts., 4 reb. Indiana Pacers Philadelphia 76ers 94-100 Domantas Sabonis 16 pts., 11 r., 3 as., Bojan Bogdanovic 13 pts., 5 reb., 1 ast., 1 stl. – Dario Saric 18 pts., 7 reb., 2 ast. Memphis Grizzlies Denver Nuggets 89-87 Marc Gasol 20 pts., 12 reb., 4 ast., 2 stl, 3 blk. – Juan Hernangomez 7 pts., reb., 1 blk., Nikola Jokic 4 pts., 7 reb., 4 ast., 3 stl. New Orleans Pelicans Chicago Bulls 107-98 Nikola Mirotic 9 pts., 15 reb., 1 ast., 1 blk. Utah Jazz Dallas Mavericks 117-112 Rudy Gobert 17 pts, 10 reb., 2 ast., 1 stl., 4 blk., Ricky Rubio 10 pts., 12 ast., 5 reb., 3 stl. – Luka Doncic 24 pts., 6 reb., 2 ast., Maxi Kleber 2 pts., 3 reb., 1 blk. Sacramento Kings Toronto Raptors 105-114 Bogdan Bogdanovic 7 pts., 2 reb., 1 ast., Kostas Koufos 2 pts., 4 reb., 1 stl,, Nemanja Bjelica 0 pts., 1 reb., 3 ast., 4 stl., 1 blk. – Serge Ibaka 14 pts., 14 reb., 3 blk., Jonas Valanciunas 11 pts., 10 reb., 1 ast., 1 blk., OG Anunoby 11 pts., 7 reb., 1 stl.